Milestone XProtect Smart Client is the clever twin sister to the Remote Client, and this member of the family has some very attractive features. When it comes to remote access and management of your IP video surveillance, the Smart Client sets new standards for client architecture and provides valuable integration options. 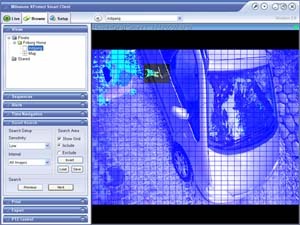 XProtect Smart Client is programmed using .NET, the coming standard for enabling faster and easier integration with other systems and partner plug-ins. With this approach, customers can look forward to realizing the promise of full security system information anytime, anywhere, on any device. The Smart Client offers all the same advanced functionality of the Remote Client and exciting new capabilities. XProtect Enterprise version 6.0 is delivered with both the Remote Client and Smart Client for unlimited numbers of users. This gives you the flexibility to choose which one best serves your installation needs and IT management structure. The Remote Client can run from the system server or from a user�s local computer, whereas the Smart Client is installed directly on the user�s local PC.